TOÑO was 4 years old when his concerned parents brought him to PROJIMO from a neighboring village. His brain had been damaged shortly after he was born, apparently by meningitis. He was multiply disabled and very small for his age. In the first meeting with Mari and other members of the village rehabilitation team, Toño's worried father explained, "I'm not even sure he can see. We try to sit him up so he can look at things around him. But he just droops his head and stares at his lap. He doesn't show interest in anything. Observation and examination. Watching Toño, the team observed that his overall development was quite delayed. He responded very little to people and things around him. He did not reach for or play with toys. Mari tested Toño's vision by moving a small light in front of his eyes. Occasionally, his eyes followed the light, but sometimes they did not. "I think he sees," said Toño's mother. "He's just not used to looking at things." Toño could sit by himself, but his whole body was floppy and he had little head control. The team tried sitting him in a special seat that was his size. An H-shaped strap held his body upright. But even then, his head drooped far forward. To keep his head from falling forward, they had to tilt the seat so far back that his head faced upward rather than outward. Only when he cried did his drooping head come up for a moment. "That gives me an idea," said Mari. "Let's try positive seating. It might help him sit more upright." She explained that positive seating means that the seat tilts forward (see Chapter 1, page 35). This differs from negative seating, the common position where the seat slants slightly back. Experimentation. Mari asked Toño's father to sit the boy in a simple child's chair. He drooped over at once. Then Mari asked his father to put a book under the back of the special seat in which Toño sat, to tilt it a bit forward. The boy's head still drooped. But, when another book tilted the seat farther forward, an amazing thing happened. Toño's body gradually straightened and he lifted his head. When Toño's father walked across the room in front of his son, the boy turned his head, following with his eyes. "He sees me!" exclaimed his father in delight. "That's the first time he has ever watched anybody move in front of him! My boy can see!" NOTE: Some therapists dislike the term "positive seating." This is because both positive (forward sloping) and negative (backward sloping) seating can be either helpful or harmful, depending on the particular needs of each child. Positive seating (sloping the seat forward) does not help all, or even most, children with cerebral palsy or developmental delay. But it does help some children with stiff, backward-tilting hips, or those with low muscle tone who have trouble sitting upright. It is especially useful for children who can sit briefly without support, but who tend to droop forward with sagging head. Often it helps them to sit straighter and raise their head. The concept of positive seating is still new to many rehabilitation workers and therapists. It is often helpful for children who, for 2 different reasons, have difficulty sitting upright. 1. As mentioned in Chapter 1, some children with spastic cerebral palsy have stiffness of the hips (pelvis) that prevents them from sitting with their back at right angles to their thighs. When they sit on a level (horizontal) seat, they tend to fall over backwards. Or they sit slouched with their back in a C-shaped curve. When the child sits on a forward-tilting seat, or wedge, this allows her back to rise straight up from the hips. (The pelvis is rotated to an upright position.) 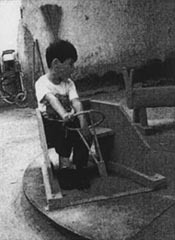 On this forward-slanting seat, the child is more stable, less tense (which reduces spasticity), and often has better head, body, and hand control. 2. Some children have low muscle tone, as in the floppy (flaccid) type of cerebral palsy, and in some mixed types. On a level seat, they tend to slump forward and have difficulty raising their heads. For such children, a forward-tilting seat (positive seating) often does wonders. The forward slant causes the child to push with her legs to keep from sliding forward. This use of the leg muscles increases overall muscle tone, which (in some cases) allows the child to lift her head and hold a more upright posture. CAUTION: Each child is different. Results with positive seating vary from excellent to counterproductive. Be sure that - if muscle tone is increased - it gives the child greater control, rather than triggering a stiff, spastic reaction (as it does in some children). It helps a child with back-tilted hips to sit upright. This increases stability and relaxes spasticity so that the child is more able to use her hands and do things. It can help the floppy child to sit upright, increasing body and head control. By enabling the child to lift her head, it enables her to watch the world around her. This stimulates vision and involves her in family activities. It can speed her physical, mental, and social development. By encouraging use of the leg muscles, it helps prepare the child to walk. Positive seating sometimes stimulates a child to use her leg muscles (to avoid slipping off the sloping seat). This helps to strengthen the thigh muscles that straighten the legs. Use of these muscles is essential for standing and walking. Thus positive seating helps some children prepare for walking at a later time. This was the case with Edgar. EDGAR was 7 years old when his mother and older brother brought him to PROJIMO from a distant village. 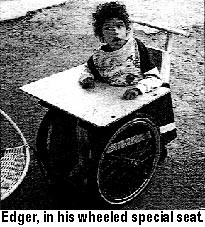 Like Toño, Edgar is developmentally delayed and has a type of cerebral palsy which is primarily floppy (flaccid), with poor balance. Also like Toño, Edgar would sit with his head drooping forward, totally uninvolved with the world around him. He spent a lot of time staring down at his upturned hand. His mother had tried hard to interest him in toys and other things, but he made no effort to take hold of them. The only thing he did with his hands was to sometimes pick at his clothing, or pull his hair. His mother was discouraged. But with all these stimulating objects and activities, Edgar showed only a little improvement. He still spent most of his time with his head hanging forward. When he did lift his head, it seemed to be with great effort, and in a moment his head would droop again. A try with positive seating. It was around this time that the team learned about positive (forward-tilted) seating, and decided to try it with Edgar. 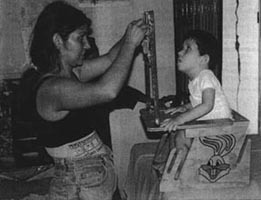 They repeated the experiment they had used with Toño, but this time they sat the child on a box instead of a chair. 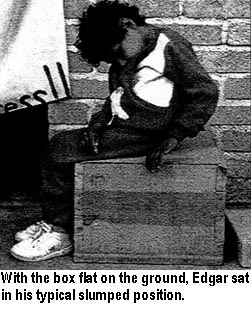 With the box tilted forward, Edgar sat up straighter. He also seemed more alert. He looked at things around him like someone who had just awakened from a dream. After only about a minute, however, Edgar looked tired, and he slowly began to droop again. Although at first he seemed to enjoy sitting on the sloping box, now he began to fret. When his mother removed the brick from under the back edge of the box, Edgar looked relieved. But he continued to droop like a wilted flower. After a few minutes, the team tilted the box forward again. As before, Edgar straightened up and became more alert. But in a moment he again grew tired and slumped over. Mari explained to Edgar's mother that, to sit upright, Edgar had to use muscles he seldom used in his thighs, back, and neck. So he tired quickly. For Edgar it would take time to gain the strength he needed to stay upright for long. He would need a schedule, with short periods of forward-tilted seating alternating with rest periods with the seat tilted back. 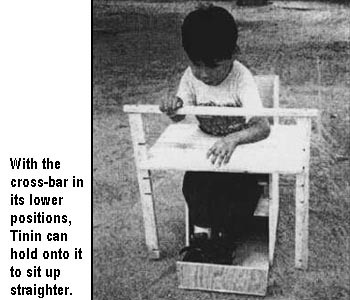 As the boy's strength increased, the length of time he could sit upright on a forward-tilted seat would also increase. In time he might learn to sit upright, even on a non-sloping seat. The team realized that getting Edgar used to sitting upright in a forward-tilted seat would require frequently shifting him back and forth, from a seat that tilted forward to one that was level (or that tilted somewhat backward). However, Edgar's mother worked all day in a small restaurant. Sometimes she took Edgar with her. More often she left him at home alone for most of the day. The child was getting too heavy to carry long distances. It would be too much to expect Edgar's mother to carry him to the restaurant and then to spend all day moving him in and out of a seat with a forward slant. Things needed to be made as easy as possible for his busy mother. So the team decided to try to design a combination of wheelchair and special seat, so that Edgar's mother could push him to and from the restaurant. 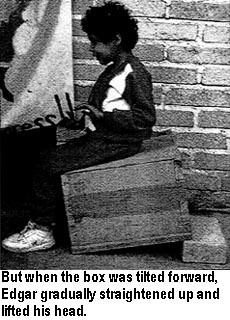 The wheeled seat needed to be easily adjustable, so his mother could quickly change the tilt of the seat-board from a forward to a backward tilt . . . if possible with the child still sitting in it. To change the seat-tilt, pull upward on the cord. In order to change the tilt of the seat, a hinged square of plywood fits on top of the fixed seat-board. To hinge the front edge of the top seat-board, a long bolt passes through the top board into the slot in the bottom board. The back-rest of the seat is made of 2 layers of thin plywood, separated by about 2 cm. To secure the seat at the angle you have chosen, slip the rope through the small slit in the rear board of the seat back. Knots in the rope are tied at distances to provide 3 or 4 different seating angles. The hook slides up and down through a long thin notch in the forward board of the seat back. A cord passing between the layers of the seat back is attached to a metal hook in the back of the seat board. A removable table - with a half-circle cut out to loosely fit the child's body - provides a space for play and eating. By holding up the child's arms, it can also help a flaccid child to sit upright. A bar for pushing the chair is mounted behind the seat back. This position prevents the child from bumping his head, and makes it easier to tilt back the chair to go up a curb. A board in front of the feet helps prevent his feet from slipping when the seat is sloping forward. Big bicycle wheels are mounted in front (with the small casters behind). This makes it easier for children who, because of spasticity or for other reasons, find it hard to reach the wheels when they are mounted farther back (see page 225). When the table is not in use, it can be hung on pegs on the push-stand. Designing this chair, the team observed that changing the slope of the seat changed the height of the child relative to the table. Therefore the table height had to be adjustable. They created a simple design that allows adjustment of both the table height and angle. Adjustment of the table height and angle is done by adjusting the armrests which support the table. Each armrest slides within a wood panel attached to the sides of the chair by small blocks. The many adjustable features of this chair allow the family and child to experiment with different combinations of adjustments, to find out what works best for the individual child. As with many children, in evaluating Edgar's progress it is difficult to separate the benefits brought by the physical equipment from the human support and increased stimulation that accompanied it. Certainly all the attention, movement, handling, talking to him, and encouragement that Edgar received during his days at PROJIMO contributed to his sense of self-worth and readiness to hold his head higher. Equally important was the renewed interest on the part of Edgar's mother and the enthusiasm of his 12 year older brother, Adolfo. 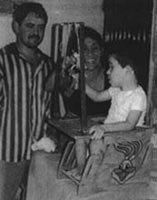 Adolfo helped the PROJIMO carpenter, Mario, to build Edgar's wheelchair. Through this involvement, Adolfo became even more eager to try it out with his younger brother, and to help him to use it effectively. In the course of a few days at PROJIMO, Adolfo learned a lot of skills for working with the boy. With words, objects, and stimulating noises, he wouid encourage his little brother to raise his head and look around, adding to the effect of the tilted seat. Also important were Edgar's rides all around the village. Back in their own village, now that Edgar had wheels, both his mother and brother were much more inclined to take him out and include him in their activities. His new seat seemed most effective in getting Edgar to raise his head when he was bumping over rough terrain, and when the scenery was constantly changing. Edgar and his family continued to visit PROJIMO periodically for several years. Members of the team also visited his distant village whenever they had an opportunity. Edgar showed slow but steady progress, physically, mentally and socially. Much of his improvement was related to his growing ability to hold himself upright. At first, when sitting in a forward-tilted position, he would stay erect only for a minute or two before slumping over again. But with practice, he sat upright longer. Eventually, he began to spend more time sitting up and looking around him, even when he was not in his forward-tilting seat. Preparation for walking. 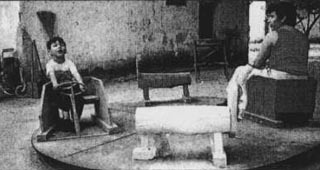 The forward-tilted seat also stimulated Edgar to use his leg muscles. The boy gradually became more able to stand and even to take a few steps with assistance. To help him get used to bearing his weight, they made a standing frame for him. The standing board held Edgar's legs and hips in a straighter position than he was accustomed to. Initially they had been very stiff, with beginnings of contractures (inability to straighten completely). As with the positive seating, at first Edgar was put in the standing frame for very brief periods (2 or 3 minutes). As he got used to it, the time was lengthened. 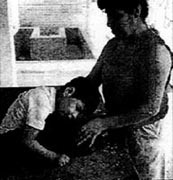 Edgar's mother and Adolfo also learned to do "range of motion" exercises to help the child straighten out and make his stiff joints more limber. Edgar showed overall improvement for about two years. Then, sadly - after the death of his father - he had a severe setback involving self-abuse. This is discussed in Chapter 8. For Edgar, standing with his standing frame made it easier to hold up his head. This probably helped for the same reasons as did tilting his seat forward. The voluntary use of his leg muscles triggered an increase in muscle tone throughout his body. After Edgar had used the standing frame for a few months, the team thought he might be ready to try a walker. PROJIMO'S carpenter, Mario, experimented with different styles and heights. Then he built a simple wooden walker for Edgar. Adolfo and a couple of the village children helped Mario. Here, a school girl who assists in making simple equipment at PROJIMO helped Edgar learn to walk. As you see, Edgar (for short but increasing amounts of time) was able to hold up his head. This walker's wooden wheels allow it to roll forward without having to lift it (which Edgar could not do because of weakness and poor balance). Also, the wheels' large size (compared to many walkers) works well on uneven ground. The walker has automatic brakes similar in effect to those of some very costly commercial walkers. The braking action was discovered by accident. The wooden wheels turn loosely on a bolt between 2 wooden struts. When the child pushes the walker forward between steps, the wheels roll easily. But when the child puts his weight on the walker to take steps, the wheels press against the side struts, acting as a brake. This braking effect makes walking easier for the unsteady child with poor balance. Although the walker worked when someone helped Edgar hold onto it, for a long time he made little effort to hold or walk with it by himself. What Edgar seemed to enjoy most was hanging onto the back of Adolfo's shirt and walking behind him. Fortunately, Adolfo enjoyed this too. So his big brother became Edgar's custom-made "human walker." the warmth, stimulation, and adventures with persons the child feels close to are essential. Positive seating does not work for all children with floppy cerebral palsy. Tinín is a child for whom other approaches worked better. When his mother brought him to PROJIMO at age 5, he had great difficulty sitting upright, as can be seen in these photos. The PROJIMO team experimented with positive (forward-tilting) seating, but Tinín slumped forward so far that he would fall off the seat, unless held. In Tinín's case, negative seating (with the seat sloping backwards) seemed to help more than positive seating. 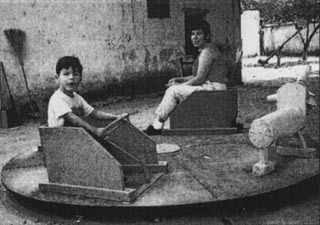 While the team tried everything they could think of to help Tinín sit upright, his mother had the idea of putting him in the merry-go-round in PROJIMO's "Playground for All Children." Actually, the idea was Tinín's. Of the 10 or so words he spoke, one was "car." Since he first saw the merry-go-round, which has a small car on it with a pretend steering wheel, he kept pointing to it, saying "Car!" Clearly he wanted to sit in it. So his mother followed his wishes. A circular platform is mounted over the axle hub of a junked car. The Thai model had 3 wooden animals to ride. But PROJIMO included enclosed seating (little cars) so that more extensively disabled children could also ride. Sitting in the small "car" Tinín tried hard to sit upright; but even with his excitement and desire, he was only partly successful. Yet when his mother - sitting across from him - started to turn the merry-go-round with her foot, Tinín began to straighten up. The faster the merry-go-round went, the more Tinín straightened up. He hung onto the steering wheel for dear life. Therapy was never more fun! Considering how his holding onto the steering wheel seemed to help Tinín to sit upright, the team began to experiment with special seating. They designed a simple backward-slanting wood seat. Above its plywood table, they added a removable cross-bar, held by upright bars with notches that snugly grip the edge of the table. The series of notches allows the bar to be set at different heights and slipped forwards or backwards, to whatever positions appear best. By following Tinín's interests and by taking an experimental approach, his caretakers found equipment and activities that helped him to gain more control of his body, and to sit in a way that enabled him to learn new skills and take part more fully in life around him. The special seat - combined with an overhead bar with toys hanging from it, and lots of interaction between the parents and the child - can do a lot to help a child gain better head and hand control, and to become more involved in the world that surrounds him.